Back in October 2017, Applied Influence Group held our inaugural influence evening seminar. During one of the evening's observations, the topic of conversation moved towards influencing teams. The thread then moved towards a familiar theme in terms of leadership; the theme being, that as the leader you will never know everything and that it is essential to learn from the people you have the privilege to lead. I am paraphrasing here as it was more eloquently delivered than my words above, but the sentiment is there; get your team to teach you as they can provide you with the answers. However, when I heard this, I opted for a more literal observation of the sentiment on offer. 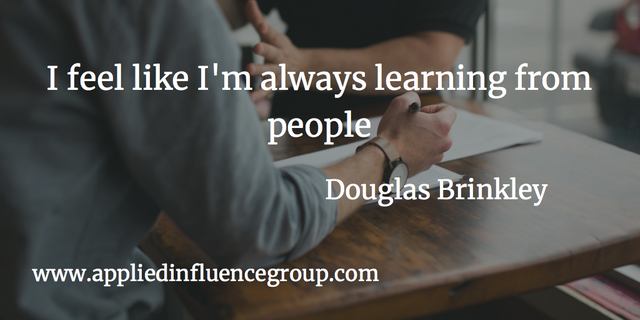 At Applied Influence Group, we aim to highlight to our clients, the importance of understanding the people, or groups of people you want to influence. When I listened to the delivery of the observation above I thought, 'what a great way of understanding somebody, quickly'. My reasoning was based around the fact that if you had access to somebody to ask them a single question and you wanted to try and begin to understand them at a deeper psychological level, getting them to teach you something would provide a hugely valuable insight. Applies pressure as it’s an awkward / unexpected / vague question which generates a level of uncertainty for the candidate to deal with. In my former military positions this was a critical skill set I wanted to assess. Forces the recipient to default to something that they actually know, or know well enough to teach you. Whatever it is they choose to teach you, provides a window into what is important to the individual. The answer will increase the level of understanding you have of that individual and can lead to some interesting follow up questions. You may actually learn something new. If you run assessment centres or interview people on a regular basis you may already do something like this, but the use of this kind of question isn’t restricted to that environment alone. I think back to the times that I lead teams and how valuable gaining an insight into the individuals that made up that team was. Asking a question of this nature at a credible point, can help you to enhance the level of understanding you have of the key people you interact with or potentially want to employ.